Most data centers utilize HVAC systems to pump pressurized air to maintain a server inlet temperature within the proper temperature range (Current ASHRAE recommendations are for inlet temperatures of 18-27 C (64.4 deg F through 80.6 deg F) and an absolute humidity/dew point range of 5.5-15C (41.9-59 Deg F). These CRAC / CRAH solutions usually provide air under raised floors but above air solutions are also available. This design struggles because it lacks precision. The HVAC system addresses an entire room, meaning some areas receive excess cooling, while others don’t receive enough. As a result, the entire infrastructure-from the fans, to pumps, to air handlers-must work harder and consume more energy in the process. Professionals facing such problems should first evaluate their cooling architecture and determine if the capacity exists to address existing and future compute loads. If this capacity exists, the goal is to harness it-to focus the cool air precisely where it’s needed. Because of the prevalence of hot aisle/cold aisle in existing data centers, one of the more practical air management strategies is cold aisle containment. 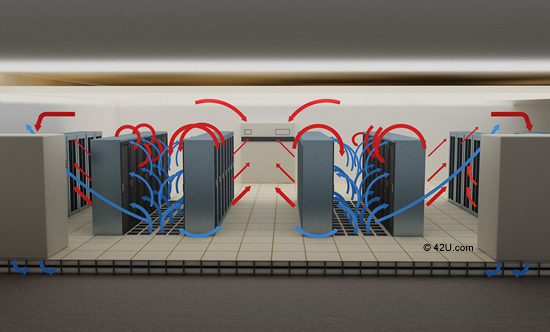 Diagram of a Data Center with Bypass Air problems (mixing of hot and cold air) – a very common cause of cooling loss. 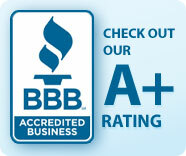 – Increased energy efficiency and performance capability of climate control. – An inexpensive way to boost the performance of your existing plant, lengthening the investment cycle until a replacement needs to be purchased. What are Data Center Curtains / Hot / Cold Aisle Containment Curtains? Data Center Curtains are an economical energy saving solution often utilizing curtain materials that have been around for a long time in clean rooms (often a higher grade to the materials you are familiar with in grocery store walk in refrigerators), and combine those with an aluminum track system allowing you to attach the data center curtains to the drop ceiling and to the tops of the racks. Cold aisle/hot aisle containment curtains are available in flexible strip and soft wall panel formats that can be customized to meet the specific requirements of any facility. 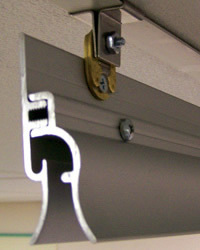 More intelligently designed aisle containment curtains utilize UL listed fuse links which melt at a temperature which is below the temperature at which your fire suppression system would be activated thus, allowing the curtains to drop to the floor, before the temperature would be sufficient to trigger a data center fire suppression system. The attachment system provided with the Simplex AirBlock data center containment curtains assures rapid, non-disruptive installation. 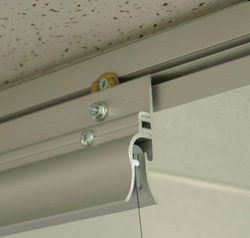 After the clear anodized aluminum mounting extrusion is installed, the curtains quickly hang in place and are secured with a matching cap extrusion. This is the most user friendly, versatile, and clean attachment system available for Cold Aisle / Hot Aisle containment. 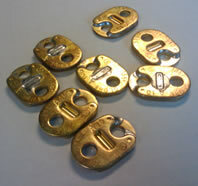 To address fire safety concerns, UL listed fuse links with 135F temperature rating are available for situations where modification of the existing fire suppression system is not feasible. Recognized as a solution to reduce energy consumption, many utility companies offer rebate programs for the installation of these containment curtains. Going Green with Cold Aisle / Hot Aisle containment curtains for data centers provides a fast, low-cost solution to better cooling, greater productivity, and significant energy savings. 42U’s containment solutions support both cold-aisle and hot-aisle segregation, depending on the unique requirements of your data center. 42U’s engineers will help you create a cost effective containment system, tailored to your data center or server room, which optimizes airflow and maximizes cooling capacity. When properly implemented, containment users typically realize immediate energy savings making them eligible in certain geographies for utility rebates. In addition to designing and installing your containment system, 42U can engage your energy provider to determine your rebate eligibility. Keep in mind rebates generally need pre-approval from utility companies, and it is important to engage the rebating authority at the beginning of a containment project. For additional information on hot aisle containment, design consultation and pricing, contact us today at 1-800-638-2638.